Having a double major in English Literature and Art History, I have noticed a clear lack of representation of African or African American art and literature unless it is being appropriated by European culture or being specifically studied strictly for the Blackness of the author or artist. I have noticed that there is a definite separation between what many of us, as Westerners, consider to be art and what we consider to be artifacts. I feel as though the course epigraph by Toni Morrison, “Black literature is taught as sociology, as tolerance, not as a serious, rigorous art form,” truly appears to be true in European and American culture. This realization has inspired me to set a goal for myself of trying to breakdown this concept and appreciate the art and literature rather than appropriating it into an assumption I make about intent. Through my art history classes, I have specifically noticed the idea of African art being appropriated and studied as historical artifacts rather than actual art. 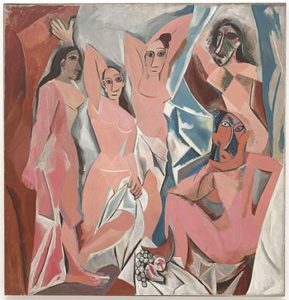 An example of this can be seen through Picasso’s work, Les Demoiselles D’Avignon, and his use of African masks on the women in his painting. During Picasso’s early stages of Cubism as well as in stages of German Expressionism there was a fascination in African and Oceanic art. 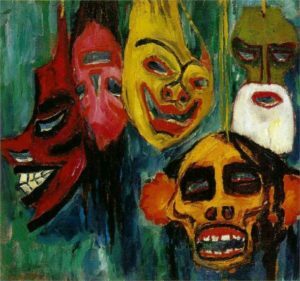 Although artists such as Picasso and Emil Nolde (Masks 1911). The art of the masks themselves was not looked at and appreciated for art, but rather an artifact that represented an “unknown” culture. Black art was often brought to the surface and appropriated by Europeans that were interested in the style of African masks. This brings back the statement Beth made in class when she discussed how European culture is obsessed with Black culture as they often try to mimic and appropriate Black culture. This can also be seen through Native American Art as it is often looked at as artifacts in comparison to European paintings and sculptures. Many white Americans view Black art and literature as sociology in a sense that it allows them to get a better sense of a culture that is different from their own so they can learn to be more sensitive and tolerant. However, there is a danger in looking at Black art and literature in that way as it debunks the artist’s creativity and intelligence as their work is often looked to represent the entirety of Black culture when in reality, these are simply single stories of different Black artists. Additionally, this concept can be tied back to our reading of Everyday Use. There is controversy over rather the quilts should be hung and treated as an artifact of African American heritage or used every day as a quilt it was made for. In European cultures there is a distinct separation between art and artifact which is often glanced over when it comes to Black culture. I think that it is important to not put Black culture in a box and assume that art is an artifact that will help with sociological studies and relationships to tolerance.